What if Hitler decided to try again for Moscow during the summer of 1942 rather than plunging the Wehrmacht deep into the Caucasus and Stalingrad as he did historically? 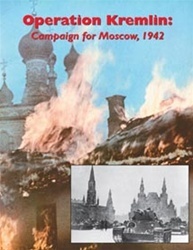 Operation Kremlin uses the corps-army level units that were historically available for this campaign. 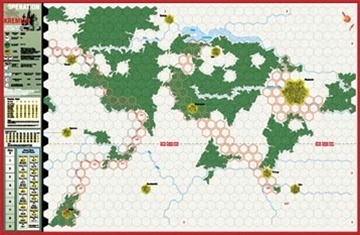 The German player is on the offensive, seeking to win by controlling Moscow and other key cities. The Soviet player, though mostly defending, must watch for opportunities to deliver counterattacks against the Germans in order to inflict a decisive defeat upon them or upset the Axis alliance. Operation Kremlin's orders of battle are extrapolated from both sides' historic organizational charts of mid to late 1942. The Germans have the units which composed Army Group Center on 28 June 1942, along with all the panzer corps that were deployed elsewhere on the Russian Front. Manstein's 11th Army enters as reinforcement once Sevastopol falls. The Germans also have the Axis satellite armies, on the assumption that their own governments would have wanted to be able to claim participation in this "final and decisive" campaign in Russia. The Soviet order of battle is based on their front line deployment of 28 June, along with all their operational and strategic reserves, plus just about everything they generated in the way of replacements and reinforcements during the time period of the historic Stalingrad campaign. Each hex represents approximately 10 miles (16.2 kilometers) from side to side. Airpower is represented abstractly, representing the effects of one side or the other having local air superiority. Each full game turn represents one week. Operation Kremlin gives wargamers the opportunity to discover what would have happened had the Germans struck for Moscow in 1942. Was this the last great chance for the Third Reich to win in the East? Or would it have led to an even greater "Stalingrad?"